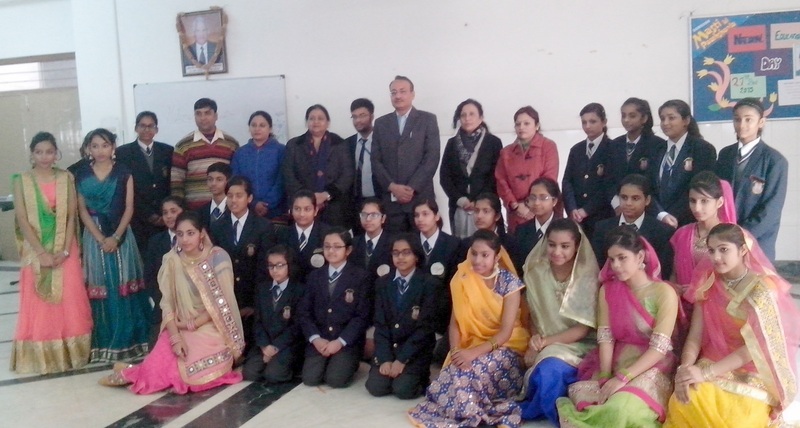 N.K.Bagrodia Public School , Sec – 4, Dwarka celebrated NATIONAL EDUCATION DAY –the birth anniversary of Maulana Abul Kalam Azad, the First Education Minister of independent India on Dec 21, 2015. The program was graced by Mr Deependra Pathak, IPS, Joint Commissioner of Police , South West Range, New Delhi. A variety of program was presented by the students . The Chief Guest lit the ceremonial lamp & inaugurated the function. The students sung a melodious Krishna Stuti to seek the divine’s blessings. A Powerpoint Presentation was showcased on the life history of Maulana Abul Kalam Azad. The tiny tots of Junior school presented a dance showing the spirit of Swachch Bharat & the duty of a true Indian to maintain their surroundings. A beautiful dance highlighting the success story of the White Revolution –Amul was showcased by the students.The chief guest gave his blessings by highlighting the stories of Socrates & Galileo to understand the true meaning of Education. He stressed on doing an introspection of oneself on a daily basis & developing the mechanism of understanding the concepts better. The program of NATIONAL EDUCATION DAY gave the message of Maulana Abul Kalam Azad of a Developed & an Educated India & the power of Education in our lives.